In the far corners of the state lies another great Northern California motorcycle ride buried in time with the lava beds that it protects. 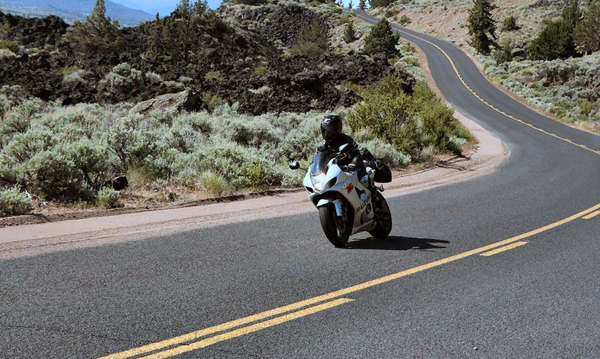 If you have ridden through the Lava Beds National Monument you have ridden on Hill Road. You won't find any exciting write-ups on the web about how spectacular this road, how amazing the views are, or how well intact the surface is. That is simply because of the remoteness of the area. Hill Road is in an area of California that most people just don't visit. It is hundreds of miles to the coastline and several hours from San Francisco. There are no five star resorts (that I know of) and no real attractions. However, for the adventurer with a full tank, it is well worth the visit. Riding through Hill Road is pretty interesting in itself as you will suddenly find yourself completely alone. Lava beds are as far as the eye can see and the road itself is generally well kept with some offroading available for those willing to leave the comfort of pavement behind. You can link up this ride with many of the other State Roads and scenic highways in the area for a great day on two wheels. For those with any interest, pretty much everyone played with rocks growing up, you will quickly find yourself off the bike and peaking your head into one of the many lava tube caves. I would highly recommend finding time to check out the area. From a geologists standpoint this area is not to be missed. If you want to learn more about how the formations occur check out the Wikipedia article on the Monument. Hill Road, although unknown to most, is definitely worth the trip. Expect to pay an entry fee though as it is a National Monument.